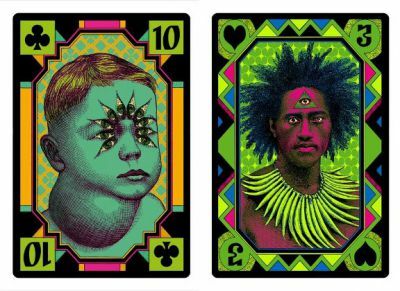 In 2012, Elzo Durt, a French artist who works in Brussels, had presented in the "Arts Factory Winter Show", an exhibition held in Paris, a set of 52 serigraph cards. Numbered and signed digital copies of the original artworks are still for sale in www.artsfactory.net and the price is 90 € for each framed card. You may notice that the number of eyes match the card value. Club is personified by a child, heart by a young man, diamond by an old man and spade by a skeleton. 666 packs of 56 cards were printed. Price and where to find: 7€, sold out in both the artist (elzodurt.com) and editor web sites.